The Sylvia Park solar was installed partly to articulate a sustainability message. In the 12 years since it made sustainability core to its development and management of the commercial and retail property portfolio, Kiwi Property is finding the market is taking notice, according to David Johnson, general manager commercial portfolio. “It is fair to say tenants have had different imperatives over last few years. During the GFC, the imperative was affordable and efficient space rather than environmental or sustainability [aspects],” Johnson says. Johnson says that there is a real awareness emerging around efficiency, sustainability and corporate responsibility. The fund recently developed a building for a large corporate client, and the fact the building is overtly sustainable and has strong environmental credentials is a big part of the client’s branding. “It gives ‘this is who we are’ messaging to the market,” Johnson says. The fund also makes sustainability core to negotiations with all tenants. During discussions around renewal or extension of leases, initiatives to make buildings more environmentally responsible and efficient are explained, together with the benefits these have for the tenant. This has had benefits in terms of tenant retention, he says. In presentations to prospective tenants, savings on power, water and waste to land fill achieved in the fund’s buildings are always included. Johnson says that in the long term, sustainability is seen as giving the fund a competitive edge. The portfolio comprises a total of 364,713 square metres in net lettable area across office buildings and retail centres located in Auckland, Wellington, Christchurch and Palmerston North. About a third of the NLA is office space and the balance retail centres. The total market capitalisation of the fund is currently $2.28 billion, with the majority of investors institutional investors. 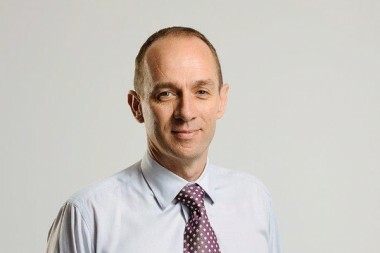 Kiwi Property’s national facilities manager Jason Happy says that since the benchmark year of 2008, a series of “small continuous steps that make a big difference” have resulted in year-on-year reductions in energy use, water use and waste to landfill. In 2015 the fund achieved 30 per cent less water and energy compared to 2008, and around 37 per cent less waste to landfill. 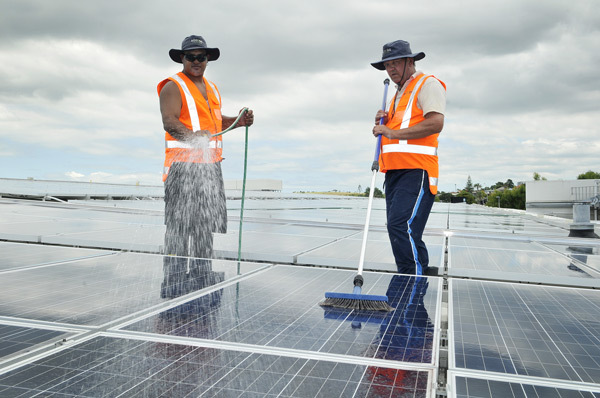 He says the policy is “not always easy to articulate to people”, which is why the fund put what is believed to be NZ’s largest commercial solar array on its Sylvia Park retail centre last year. “We were after a flagship project for our sustainability efforts,” Happy says. The installation comprises 1134 panels covering 3000 sq m, and has been providing up to 20 per cent of base building energy needs. “We’ve exceeded expectations with year-round productivity; the three months of winter delivered a surprising 18 per cent of annual energy produced,” Happy says. He says going solar was a commercial decision because the technology has reached the point where it would deliver commercial benefits. It is also a good fit with the retail centre in terms of its hours of trade and large roof area. The centre also had two free electric vehicle charging stations installed. Happy says the fund wanted to support the national rollout and adoption of EVs, which has become a central plank of the NZ government’s post-Paris emissions reduction policies. It also wants to be leading the market, attracting customers to the centre that are early adopters of the technology and future-proofing the assets in terms of the expected uptake of EVs. Now it is looking to roll the charging stations out at three of its larger malls in Auckland, Palmerston North and Christchurch. Overall, the sustainability strategy builds into the fund’s overall brand, he says. It is also part of future-proofing and de-risking the portfolio so it can be well-positioned for a carbon-constrained economy. Investors, he says, will increasingly look to partner with organisations that are cognisant of sustainability. This is part of the motivation for annual CDP reporting, he says. In 2015 Kiwi Property was the only NZ fund to achieve an “A” grade from CDP. Another credential the fund has been working with is NABERSNZ ratings. The first property to gain a rating was a late 1980s office tower that achieved 4.5 star NABERSNZ. There is no commercial building disclosure of ratings in NZ, Happy says, but it is another element in preparing for the future that investors can recognise. For tenants, and prospective tenants, it is proof a building is well run. Demand for NABERSNZ rated space is currently muted, but he thinks it will build. This will be driven not so much by savings on energy and water bills, but by the health and wellbeing aspects of an efficient, well-managed building. The fund is now assessing the balance of its office portfolio and undertaking initiatives to ensure a good rating. Happy says the fund has a “good foot on the throttle” of building controls, so it can ensure they use energy efficiently. There has been substantial investment in BMS systems, plant upgrades focusing on more efficient and cost-effective equipment such as air handling units and chillers, and base building LED lighting upgrades comprising 5000 fittings across all the commercial assets. “That is starting to yield positive savings,” Happy says. The long life of the LEDs is also a positive in terms of maintaining customer service standards. The waste to landfill reduction strategies are carried out in conjunction with tenants, he says. The focus has been on upping the rates of both base building and tenant recycling of plastics, paper and cardboard. Next in his sights is organics, a waste stream that is more of an issue in the retail properties. Happy says the facilities managers are front and centre to achieving the fund’s sustainability outcomes. Targets are set for the FMs, along with benchmarks, and these are monitored. “You can get a fantastic building, but you need the right facilities manager [to achieve outcomes],” Happy says. The FMs in the retail properties are direct employees, the commercial portfolio FMs work for two boutique firms the fund helped establish. All the FMs are “very passionate about sustainability”. All tenants receive an onboarding manual that explains how the building works and its sustainability initiatives. The building operating rules include a requirement for all tenants to participate in waste and recycling programs, and the fit out manuals mandate specific types of light fittings and materials. He says the end game is long-term benefit for the fund, making buildings competitive not only as a place to be a tenant, but also as properties in which to invest. David Johnson says the fund recognises it needs to position itself for the future. Currently, Auckland has historically low vacancy rates due to population growth and employment growth. The Central Government is a major procurer of office space, and comprises 45 per cent of the Wellington market, Johnson says. The central agency tasked with procuring property for the government is mandating good performance specifications, though not requiring they include a formal certification or rating, he says. The leaders driving demand for sustainable building design are the local councils, Auckland in particular, Johnson says. It requires that all new offices being designed and built in the city be 4 Star Green Star minimum. He says, though, that the appetite for Green Star is not as great as it once was. “When Green Star first came out, every developer worth their salt was designing to 4 Star or 5 Star Green Star and using it as a marketing tool,” Johnson says. The market is now more sophisticated, he says, and is seeing that a tool that reflects how the building performs when it is in use, such as NABERSNZ, is a better way of capturing the efficiency and sustainability aspects.